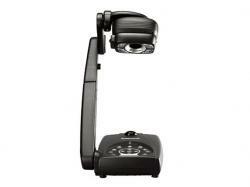 AVerMedia AVerVision 3.2MP Document Camera: The AVerMedia AVerVision 300FA+ document camera is designed keeping in mind your presentation and classroom needs. The powerful 3.2MP sensor ensures that you have the best possible image clarity within this economical price range. The patented detachable LED light module helps in positioning the document under the camera so as to give you the best possible image. Compatible with PC and Mac computers, Software and User Guides are available for download from the Resources Tab. Compatible with most Interactive White Board brands.